While it might all be convenient and easy to simply put a desk and a comfy chair into a room and call it a home office, more thought should be put into the creation of a study room to ensure productivity and focus. How you choose to decorate and style your home office is completely up to you and should support what you plan on doing within the space, but if you are struggling to plan and design your home office, have a read through these 8 tips to help you create the perfect home office space. Consider adding a piece or a couple of pieces of fun art to your study. The inclusion of artworks tend to evoke creativity within a person and are a great way to break up an otherwise structured and clinical room design. Go with something colored blue to instil calmness, efficiency, and focus, or a fresh yellow to improve energy and optimism. Seeing a gorgeous piece of art every time you enter the room will be refreshing to the mind and give you a moment to relax and be reinspired. Ensure the room has a sense of comfort and doesn’t feel sterile. Think about adding a soft, fluffy rug to add a touch of softness and texture to the room or a throw blanket and pillows to the chair to ensure maximum comfort while you are working. These additions also help in giving you moments of relaxation between business, and ensure you are sitting in a comfortable and productive position that doesn’t cause you to slouch. While the white study rooms are all the rage on Pinterest, they may not be the best for your creativity or your emotions. Consider breaking away from the cliche of white home offices for something that energises your mind. While you don’t want to go intense with the wall, choosing a simple motif on a white background is the perfect compromise between chic and practical. 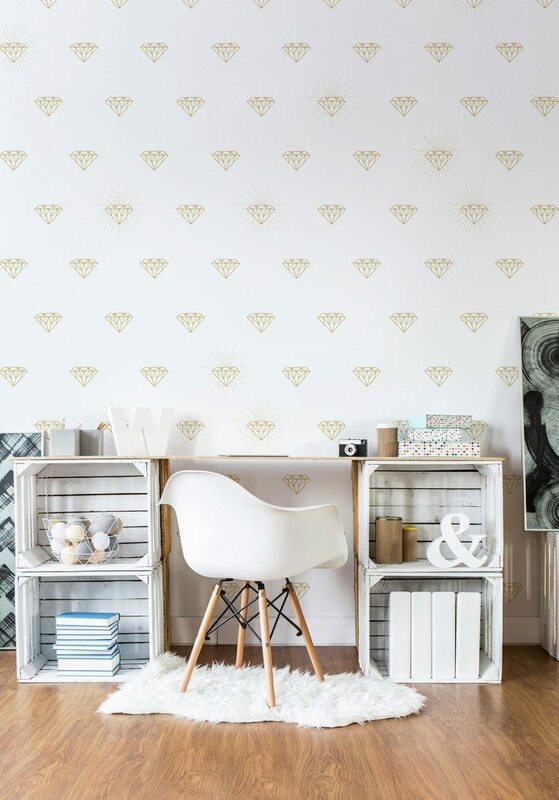 ‘Gold Diamonds‘ by Muffin & Mani is a beautiful, simple wallpaper that could be easily used in your home office without being overwhelming or obnoxious. Bonus, if you have a smaller room, the white background of ‘Gold Diamonds’ will help to trick the mind into believing the room is larger than it actually is! Keep your home office clutter free and relatively organized to allow for fewer visual distractions and a better working environment. Additionally, keeping the space tidy will keep your stress levels down and make it easier for you to complete your work, without becoming overwhelmed. You’ll be surprised at how this single tip will improve your productivity and keep you focused throughout the day. The difference some good lighting has on your work and productivity is impressive to say the least. Ensure you have fantastic natural light during the day, and some great lamps or indoor lights that will keep the room bright and you in work mode right into the afternoon and early evening. Good lighting will also keep you alert and will stop you from straining your eyes, especially if you are working on a computer all day. A scented candle can be a fantastic help on your stress levels and also calm the mind and relax. Although don’t get one that is too strong and overbearing, because that could give you a whole other set of problems that you don’t need in your home office. A small candle or incense will do the trick. Investing in some fantastic storage solutions like shelves, containers and cabinets is a necessity for a home study space. Keeping things organized will be key to making sure you know where everything is kept and making sure you never throw out an important document ever again. Make sure the storage solutions you choose are easy for you to manage, because as things get busier and the office gets used more, the faster it is for your storage spaces to become cluttered and overflowing in an unorganized manner.